At Hog Roast Lanchester, we aim to exceed our customer’s expectations when catering, regardless of the event or party or its number of guests and no matter the formality of the occasion. We’ve spent many years now providing tasty food at a great price and all the while with first-class service, treating all our customers the same, as we simply want to share our love and passion of food with others. Whether you’re organising a barbecue in your back garden, a hog or spit roast feast for your wedding day or a corporate do, or if you want to hire one of our machines so that you can DIY, our Hog Roast Lanchester team will do their best to help you to have a perfect day. 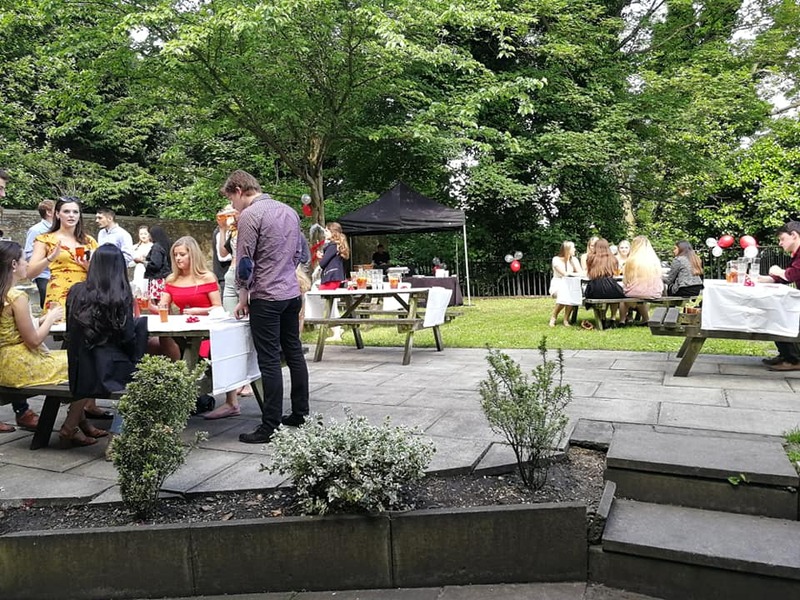 We were recently asked by Durham University Law Society to cook a traditional hog roast outside in the sunshine for a lovely garden party, so that we could make our famous pigs in buns. Durham Uni’s Law Society is run by students, for students, in order to facilitate access to legal information. This year is the fifth time that Hog Roast Lanchester has been asked to cater the annual garden party and we are privileged to have such repeat custom. We aim to please and with repeat customers, we know that we have, and it’s always a pleasure to cater this particular event. 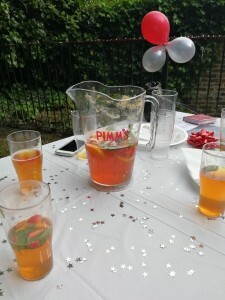 On the day of the party, the weather was amazing and the guests relaxed in the garden, enjoying nibbles while the hog was being roasted to perfection. We had set up our large gazebo and were glad of the shade it provided from the hot sun. The garden had been enhanced with red and white balloons and decorations, as well as star confetti on the tables and picnic benches and the Law Society had provided jugs of the summer staple drink, Pimm’s, with strawberries added. Once the hog was ready, it needed a bit of a rest, so we sliced the bread rolls, dished up the sauces and stuffing and then we were ready to serve up some tasty hog roast rolls to the hungry students.